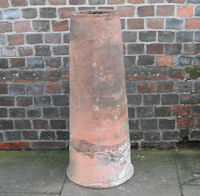 Original, quality 1920's bellied shaped red terracotta chimney pot with a rolled over top rim. 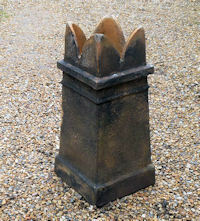 A short hairline crack to one side so not suitable for back up on the roof, but ideal for a garden feature. Otherwise complete. 24" tall + 10.5" exterior top. 12" exterior bottom and inner 8" diam. 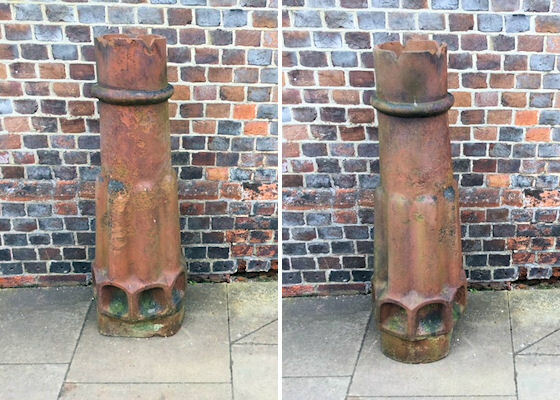 Original, quality late 19th century glazed stoneware crown top chimney pot. Complete and in good order with just one tip missing from one top point. This example is great for use back up on the roof or just as a garden feature. 29" tall, 13" x 13" base and 9" internal diam. 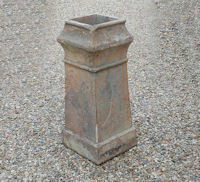 Original, quality late 19th century buff coloured stoneware six sided chimney pot. Some minor chips to the base, one to the top and one short hairline crack from the base, so not suitable for back up on the roof, but a good garden decoration or planter. 28.5" tall x 14" top exterior. 9" internal diam and 14.5" base exterior diam. 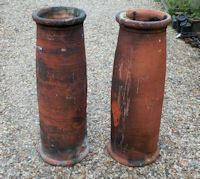 Original, quality late 19th century buff coloured terracotta vented chimney pots. 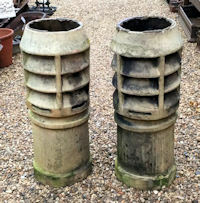 This cylindrical pair have vented upper sections and are good for back up on the roof or as a garden feature. Complete and in good and working order. 32.5" tall + base exterior 13.5" diam. Top aperture 9". 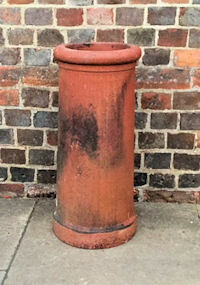 Original, quality 1930's red terracotta chimney pot with a tapered body and a rolled over top rim. Perfect for use back on the roof of good as a garden ornament. Complete and in good and working order. 24.5" tall, base 11.5" exterior diam and interior 7.75" diam. 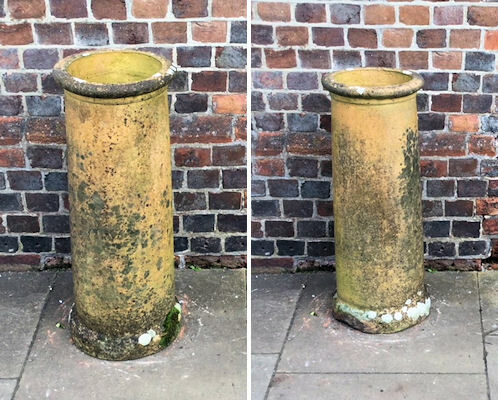 Original, quality circa 1900 buff coloured stoneware cylindrical shaped chimney pot in perfect order. 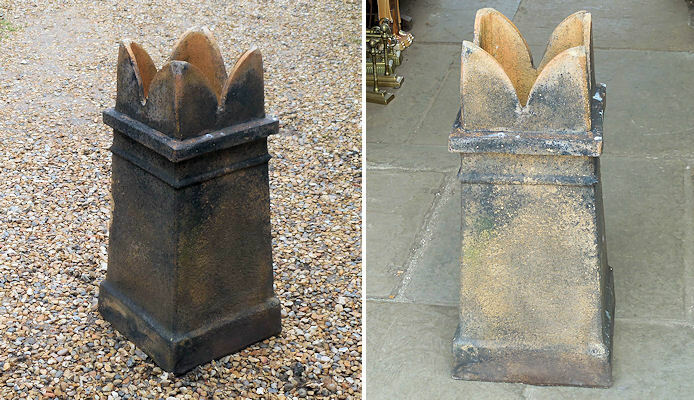 This clean example is suitable for back up on the roof or just as a garden feature. Complete and in good and working order. 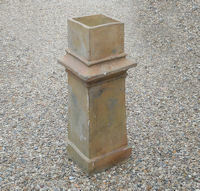 Another matching chimney pot may well be available ref code: CP123. 31" tall + 11.75" widest and inner diam 8.75". 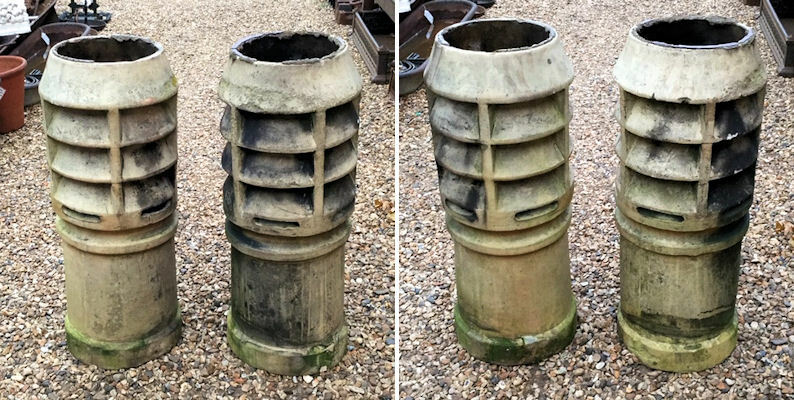 Original, quality circa 1900, buff coloured stoneware cylindrical shaped chimney pot in perfect order. 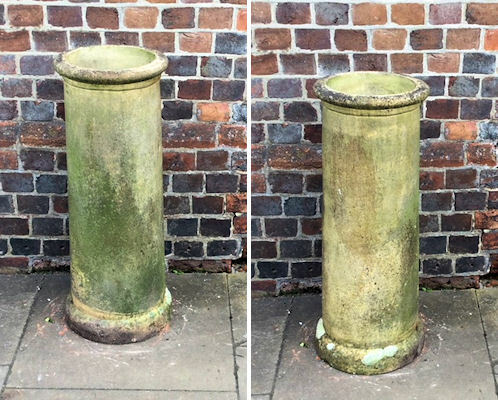 This clean example is suitable for back up on the roof or just as a garden feature. Complete and in good and working order. 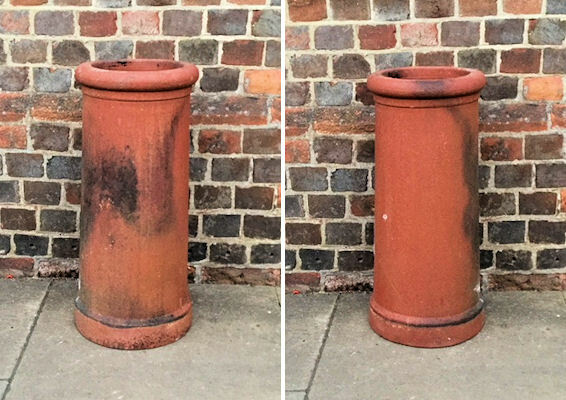 Another matching chimney pot may well be available ref code: CP124. 31" tall + 11.75" widest and inner diam 8.75". 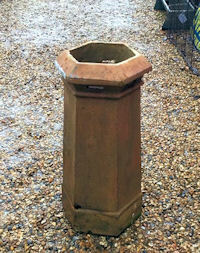 Original, quality circa 1900, red terracotta vented chimney pot. This good looking example has a hairline crack to one side and a substantial hole to the vented area, so this one is only suitable for a garden feature and complete otherwise. 36" tall + 14" widest and inner diam 9.25". 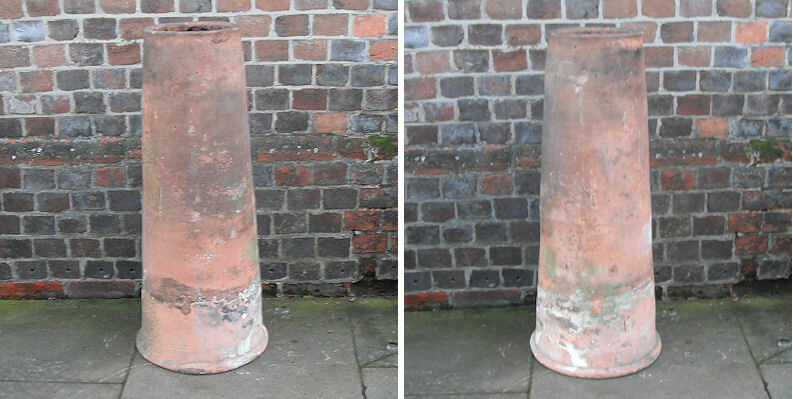 Original, quality late 19th century tall cylindrical buff coloured stoneware vented chimney pot. Some minor chips to the vents, otherwise complete and in good and working order. Ideal for back up on the roof or as a garden feature. Another near matching chimney may well be available ref code: CP120. 39.5" tall + 14" widest and inner diam 7.5". 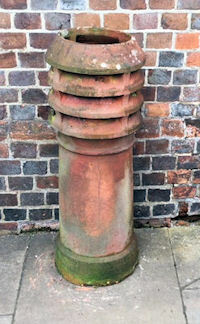 Original, quality late 19th century tall cylindrical buff coloured stoneware vented chimney pot. Some minor chips to the vents, otherwise complete and in good and working order. Ideal for back up on the roof or as a garden feature. Another near matching chimney may well be available ref code: CP121. 41" tall + 14" widest and inner diam 7.5". 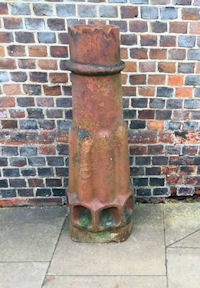 Original, quality 1920's / 30's tall red terracotta chimney pot with a rocket shape. 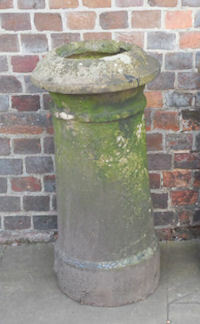 This unusual example has eight tubular vents to the sides, a tapered body and a rectangular shape to the base aperture. The top points appear to have been trimmed, if indeed there were any ? and all is complete and in good order otherwise. 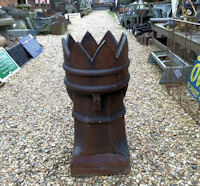 Very suitable for use back up on the roof or a super garden feature. 45.5" tall, top diam 9" external, 8" interior diam and base exterior 14" x 11". 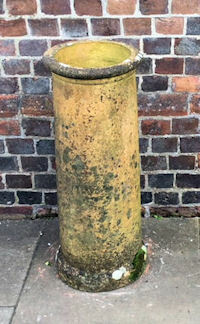 Original, quality late 19th century cylindrical shaped buff coloured stoneware chimney pot with a rolled out top rim and a plinth shaped base. Impressed to the side "H.Doulton & Co 36" for the manufacturer. Perfect for use back up on the roof or as a garden feature. Complete and in good and working order. 36" tall, top exterior 13" and internal aperture 9.5". 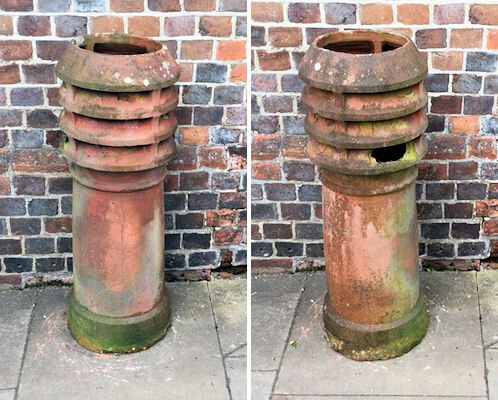 Original, quality late 19th century tapered red terracotta chimney pot with a rolled over top rim. Some structure flaws around the body and one chip to the top rim. 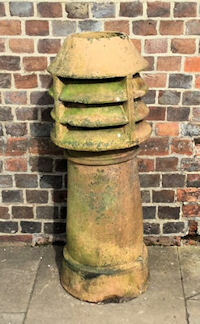 So not good enough for back up on the roof but ideal as a garden feature or for use as a rhubarb forcer.. 25" tall x top diam exterior 10". Base diam exterior 13.5" and top inner aperture 8". 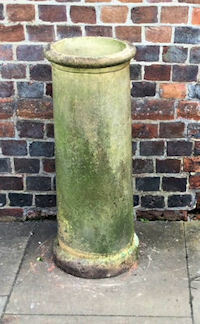 Original, quality mid to late 19th century cylindrical shaped buff coloured stoneware chimney pot with a deep plinth and a shaped top rim. Weathered to a good colour and some minor flaking has occurred. Has the top rim taken off for some reason, but otherwise, this is ok for back up on the roof or just as garden planters. 33" and 34" tall, top diam 8" interior, widest 14.5" and base diameter and 13.25" exterior. 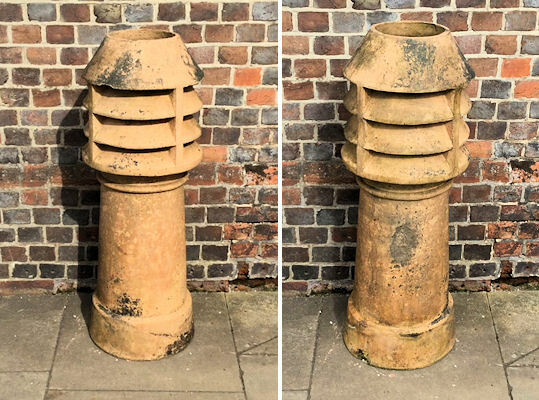 Original, quality late 19th century square buff coloured stoneware chimney pot, with a tapered body and a corner castellated top. Some old minor chips to the tips but otherwise complete and in good order. Ideal for back up on the roof or as a garden feature. 30" tall x 14" x 14" base and 9.5" x 9.5" top. 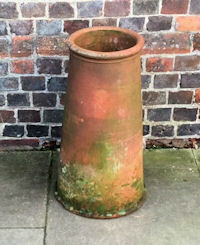 Original, quality late 19th century hand thrown red terracotta chimney pot of a tapered shaped with a rolled over top and bottom rim and a decorated band near the top. Sadly these super and tall chimneys are well weathered and showing signs of weather damage, flaking and with the odd short crack. Not suitable back up on the roof but good for garden decoration. 37" tall, 11.5" top diam exterior and base 13.5" diam exterior. Price is for each. 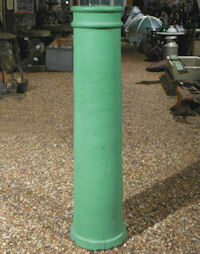 Original, quality, late 19th century, tall cylindrical shaped buff coloured terracotta chimney pot repainted pastel green. 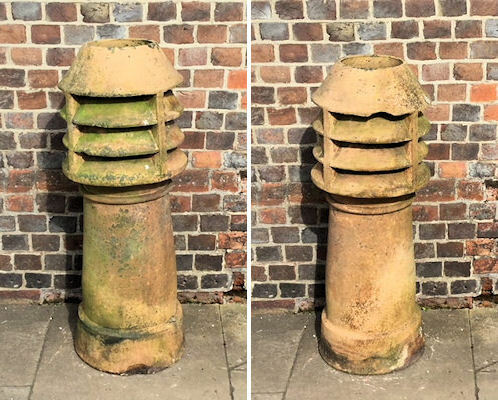 Although this chimney is complete it does have a couple of minor firing cracks to the base and one hairline crack running up from the base, therefore this pot is not suitable for use back up on the roof, but will make a super garden feature. 56.5" tall, inside top diameter 8.75", base 14" exterior diameter. 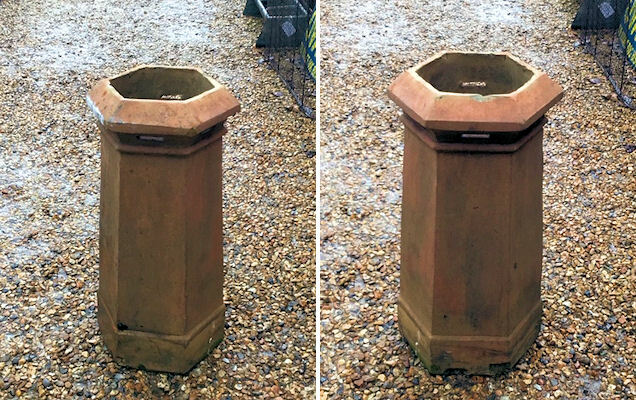 Original, quality, late 19th century, buff coloured, square stoneware chimney pot, well weathered to two sides. Some minor cracks and chips, but fine for back on top of the roof or as a garden feature. A good heavy example. 31" tall, internal 7.5" x 7.5", base 13" x 13". 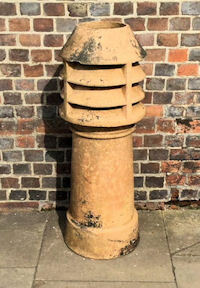 Original, quality, late 19th century, buff coloured, square stoneware chimney of an unusual form and impressed for the manufacturer "George Skey Wilnecote Works - Nr Tamworth". Some weather damage and a firing hairline crack to the top, otherwise a good heavy and solid chimney. Ok for back on top of the roof or better still as a garden feature. 34" tall, internal 7" x 7", largest 12" x 12" exterior, base 11.5" x 11.5" exterior. 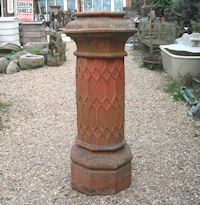 Original, quality, mid to late 19th century, red terracotta chimney pot of an unusual design. 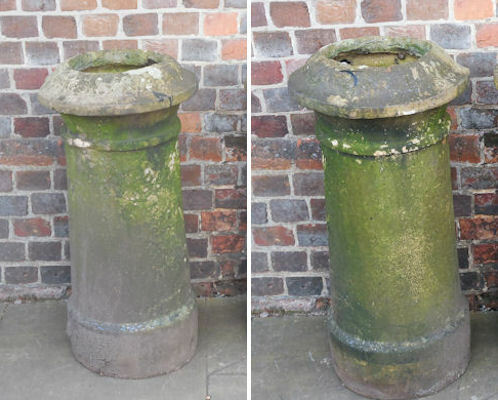 This heavy example has a cylindrical body with an octagonal shaped top and base. The cylindrical section is embossed with an elongated honeycombe design. Half the top inner rim has boken away, but all is complete and in good order otherwise and still very usable back up on the roof or as a garden planter. A most unusual design. 42" tall, base 16.5" diameter, 17" widest, 10" top aperture diameter. 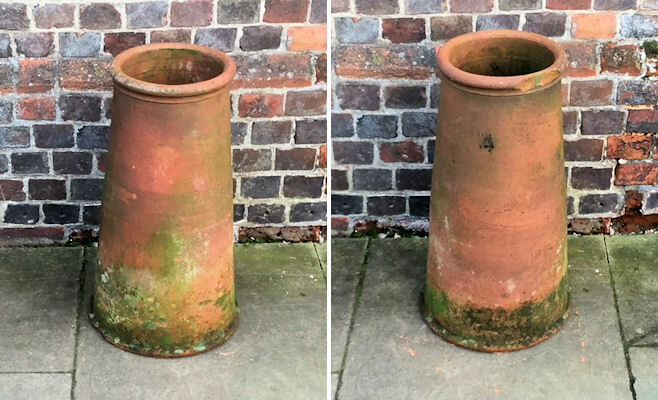 Original, quality, mid to late 19th century, hand thrown red terracotta tapered chimney with a rolled over rim to the base and a plain top. Ideal for use back up on the roof or as a garden planter. Complete and in good order. Base 14" diameter, top 9.5" diameter, total 34" tall.